Airfare deals are typically only available on limited dates. We recommend that you use Google Flights to find dates to fly, then book through an online travel agency, such as Orbitz, but in this case it appears you must book directly through Delta. Flights deals to Brazil are available once again this week with nonstop service between New York (JFK) and Sao Paulo, Brazil (GRU) on Delta for under $500. In October, there were also a couple of deals to Sao Paulo and Rio de Janeiro. Today’s sale fares start at $479, with plenty of travel dates available between January and September 2016. Note that a few flights seem to include a short connection in the US, but it’s certainly possible to book an itinerary with nonstop service on flights to and from New York. Don’t forget that you need a visa to visit Brazil, so make sure you’re eligible to get a visa before you book. New York (JFK) to Sao Paulo (GRU) for $479 in February on Delta. 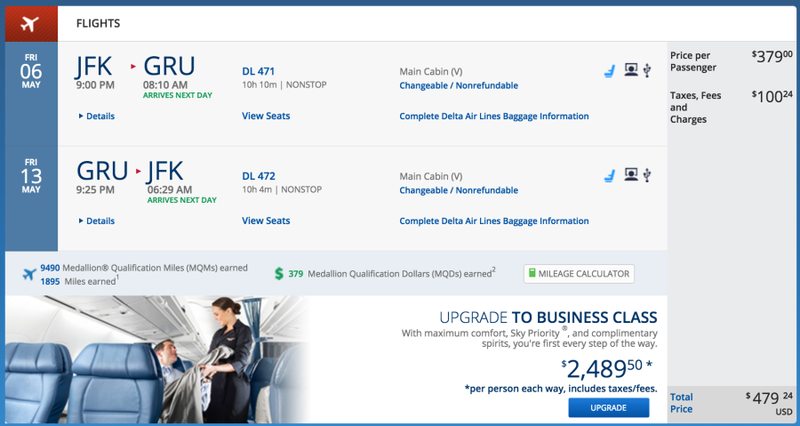 New York (JFK) to Sao Paulo (GRU) for $479 in March on Delta. New York (JFK) to Sao Paulo (GRU) for $479 in May on Delta.